Thrifty in the Burg: Coupons! Keeping it Simple! I am very new at the couponing scene and I am not claiming to be an expert in any way. I have been slowly learning the in's and out's of using coupons and I am still learning how to use them at their max potential. I am constantly looking at websites and YouTube videos to learn more. So for today's post I thought I would share a few things I have learned so far! I hope everything will make sense and that I don't go overboard with information. As I was preparing to write out this post I got to thinking, where did coupons start? How long ago did they come around? I was so surprised to see how far back coupons went. I found that in 1888 co-founder of Coca Cola, Asa Candler, had the idea to use paper tickets for free glasses of coke to help market his company. In the years between 1894 and 1913 an estimated 8,500,000 cokes were given to the American people for free. After that, many other companies decided to use the coupon idea to market their products and companies. And there you have it! The coming of coupons! In this post I am just going to keep to the basics and then I will provide some links that will help you take your basic knowledge further. If you were like me then you were probably super confused, scared, and felt a little lost when it came to coupons. Have no fear! It is pretty easy once you get the basics. And that is what this post is all about. One of the first questions I had when starting off was where can I find coupons? The internet is a great start. You can just Google coupons and wah-lah! So many awesome sources to go off of and so easy to find. Coupons.com is my go to source for online coupons. It has many categories to choose from and many more products to choose from as well. Unlike being able to clip as many coupons from the papers as you can find, online coupons usually have a limit. About 2 per computer is allowed. So if you find a great deal and need that great coupon, be sure to take advantage of your husband's computer as well as yours! The typical source of finding coupons is your local papers. I only receive the Smart Source booklet and that is good enough for me, for now at least. Sunday newspapers I believe carry SmartSource, Redplum, and Procter and Gamble. So either subscribe to your local paper, or ask a friend for the coupon booklets that come in the paper. Waste not! With today's technology, it has opened a whole new door to saving at the grocery store and using coupons. There are so many apps out there that will give you money back on items that you purchase, percentage discounts, and earn gift cards to a large selection of stores. So if you have a smart phone you might want to check out these apps: Ibotta, Checkout51, Snap, Shopkick, and Walmart's Savings Catcher. I have written a few reviews on a couple of these apps and will continue doing so with more I find. Ibotta, Checkout51, and Snap are all similar apps in the sense that you can earn small amounts of money back when you purchase certain items. They are pretty easy to use. I will write reviews for these apps in the next couple of weeks so you can get more familiar with them and see how they work. How many can/should I use? When it comes to how many coupons you should use, I would get yourself familiar with the process before going all crazy with huge purchases. When I got familiar with the process I asked myself what I wanted to achieve with the whole couponing thing. I know I wanted to create a decent stockpile. So, with that in mind, that helps me determine how many coupons to use in a shopping trip. When something like toilet paper is on sale, and I can get it at a super cheap price, I want to use as many coupons as I can to get as many items as I can, without clearing the shelf. Four is the typical amount allotted per transaction, and sometimes per day, and that is what I usually stick with. But if I want more than four of that item, I might have to make another trip later in the week. Note: When an item is at a rock bottom price some people will take advantage of that sale and clear the shelves of those items. Don't be that person! Be mindful of others that are in need of that sale too. DON'T BE A SHELF CLEARER! 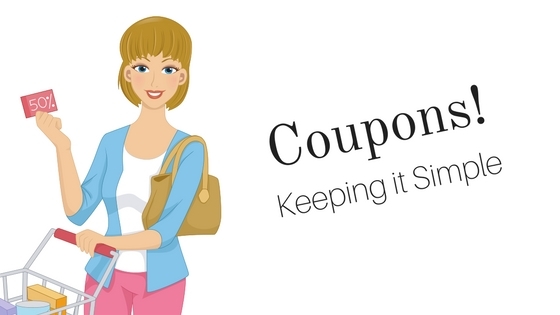 Tips on How to Use Coupons! So some tips for you all when using coupons. These will be helpful and handy to help you get some bang for your buck! When you think about using coupons, you probably think "I can get big items and get $1 off the price!" Well, yes and no. You want to get the smallest item you can with a coupon because it will make the price as low as possible. Example: I bought some Jergans lotion a few weeks back, I had a coupon for $3 off 2. I could have used it on large bottles and paid a somewhat smaller amount, but instead I used it on the smallest size I could and got the lotion for .34 cents! I was able to get 4 of them. Another thing to remember is to always read the fine print of the coupon and make sure you understand it. You don't want to get in line with your purchase planned out to find that some of your coupons won't work because you can only use one. So read and understand. Something else that is handy, know the store's coupon policy! I always keep a printout of the store coupon policy that I am shopping at. It has come in handy. On one shopping trip one of the clerks at the store I was shopping at wasn't familiar with the store's coupon policy and I had my print out with me. So she was able to look over the policy and continue with transaction. Another tip, go at a time when the store is the slowest. This will help with the tension of people getting aggravated that you are taking a bit longer due to the coupons and price matching. It will be so much easier. I have found that the best time is around 10 am or late at night around 9 or 10 pm. I hope this post was helpful to those of you that wanted to know more information on how to use coupons. Here are some links that will be beneficial for you, and help you learn more. They are from TheKrazyCouponLady.com. My go to source for all things couponing! Do you have any questions for me?? Ask in a comment and I will answer to the best of my knowledge or provide online information about your question. Do you have any tips to share with me and others reading this post? Please leave comments! I use coupons frequently. I discovered KCL and kind of went with it. Some things that have really helped me is staying ON TOP of cutting and organizing. I have a binder full of coupons that are sorted by type in those like card holder sheets. I think that the other thing that a lot of people run into is when the cashier argues with you about the coupon (without even scanning it) --- how do you handle situations like that? When planning my shopping trip I always prepare myself that some of my coupons might not work. I have not yet come across a cashier that argued about a coupon but I think if that did happen I would make sure I read the coupon correctly and then ask fora manager. If that doesn't work then I would just have to deal with not being able to use that coupon. I hope that is helpful! Thank you for the comment! I'm going to be coming back to this for coupon advice. I'm trying to become a frequent couponer! I've pinned this as well! Thank you Kate for the comment and the pin!